In today's weekly broadcast, host Doctor O discussed the approaching launch of G Title Booster 01: Touken Ranbu -ONLINE-, giving an early look at the first TV commercial for the title booster set. Doctor O also showed off a foiled poster for G-BT04: Soul Strike Against the Supreme, one new Angel Feather card from the set, the previously-seen promotional card Light Elemental Sunny, the 1/8th scale Minerva figure that launched this month, and a new set of sleeves made available through Bushiroad of Japan's promotional campaign. The complete broadcast can be viewed below. 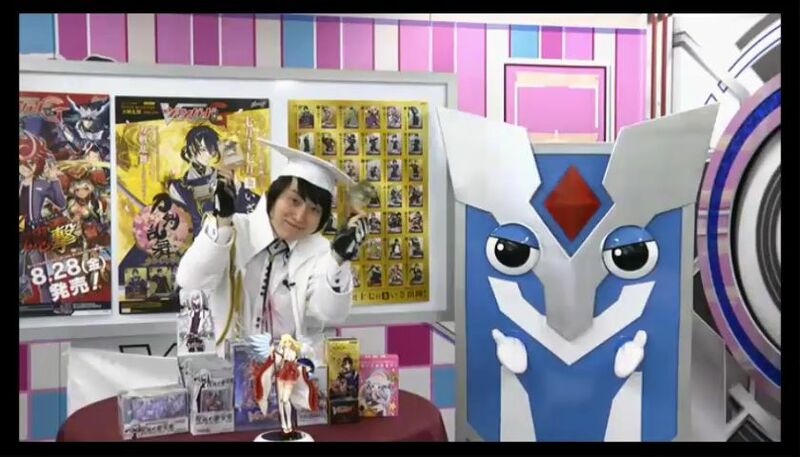 The broadcast showed a new generation break grade 2 for Angel Feather, "Black Sniper, Harut." Named for one of the angels of the Qu'ran, Harut's skill acts as the new Angel Feather's equivalent to Steam Fighter Amber. When Harut attacks a vanguard and is boosted, for counterblast 1 she can add a card face-up from the top two cards of the deck to the damage zone, then call a face-up unit to the rearguard--these conditions prevent her from unflipping the damage that she just counterblasted, but can serve as either a net +1 in card advantage or allow for an aggressive means of getting out an additional attack in the turn. AUTO (Rearguard circle): Generation break 1: [Counterblast 1] When this unit attacks a vanguard, if this unit is boosted, you may pay the cost. If you do, look at two cards from the top of your deck, choose one from among them, put it into your damage zone face-up, put the remaining cards on the bottom of your deck in any order, and choose a face-up card from your damage zone, and call it to a rearguard circle. 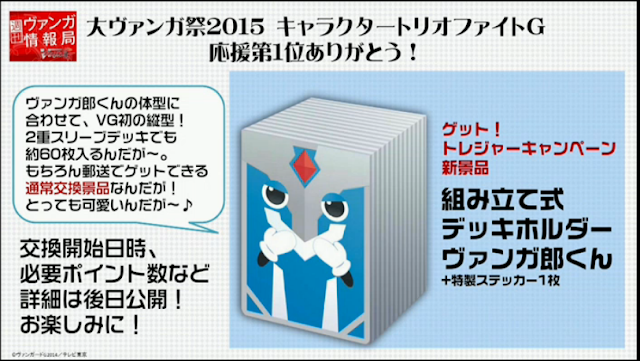 Doctor O also revealed an upcoming product available through the Japanese Get! Treasure Campaign, a set of 60 Vangarou-kun themed sleeves that were seen being used in previous broadcasts by the character himself. Japanese cardfighters will be able to exchange points found in their booster packs for a full set of these sleeves; importers will have to buy them secondhand. Bushiroad's weekly information bulletins air every Tuesday evening at 8:50 PM Japanese Standard Time. They first began in late January to accommodate a new information distribution model for Cardfight!! Vanguard G, as the amount of card information covered in Monthly Bushiroad magazine decreased and was redirected to other routes of distribution. The previous week featured a fight between Doctor O and mascot character Vangarou-kun using Harmony and Duo Bermuda Triangle decks, while the week before contained the announcement of G-BT04: Soul Strike Against the Supreme. In other news, the English-language Cardfight portal updated today with a list of participating stores for the G-BT03: Sovereign Star Dragon prerelease event. Held over the 4th of July weekend, participants will receive a PR/0194EN Sabmyu with their entry. The playmat for the prerelease will feature Genesis Dragon Amnesty Messiah, one of the two generation rares from the set.